Welcome to Ethel M's Chocolate Wonderland. Visitors to Las Vegas who take the bus tour to Hoover Dam are usually quite surprised to find, in warm Las Vegas, their bus also makes a stop at a working chocolate factory. During the holiday season, those buses may even make night visits. The Ethel M Chocolate Factory in Henderson, Nevada is part of the Mars, Inc. family of businesses. M&M candy, Milky Way, Snickers, Twix, Dove, Juicy Fruit gum, Life Savers….even Uncle Ben’s products and Pedigree pet foods are all Mars products. The Ethel M brand is Mars’ high-end chocolate brand and is named after the late Forrest Mars, Sr.’s mother. Local Las Vegans know that a visit to the Ethel M Factory is always a delight for visitors. Not only is the factory tour free (including a free sample Ethel M chocolate at the end of the tour), but two retail stores keep visitors occupied. It’s also helpful to know, that the “tour” is self-guided with video displays providing information about the various chocolate production stages seen from the tour aisle. One M&M’s World store features a variety of products, mostly for young people, featuring the logo of M&M candy. The other store features Ethel M’s products in candy bars, boxes of chocolates, bags of chocolates, individual pieces of candy, syrups and even decadent hot chocolate with handmade whipped cream, a Las Vegas valley legend. A trip to the Ethel M factory also means a visit to the company’s four-acre cactus garden. Countless souvenir pictures of trips to the Las Vegas area feature vacationers standing in front of one of the larger varieties of an Ethel M cactus. 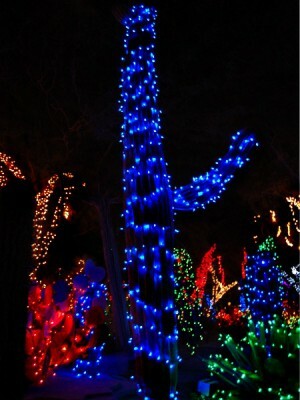 For the last 18 years, the Ethel M cactus garden has been decorated with holiday lights and characters. Last week, the official lighting ceremony for the 2011 holiday season was held on a stage in the Ethel M parking lot. Guests were invited to bring a new holiday toy for admittance to the ceremony. Some 200 new toys were collected. A substantial crowd watched and listened to songs of the season by two local madrigal choirs and by Las Vegas performers Human Nature and Zowie Bowie. The master of ceremonies for the event was comedian George Wallace. Through January 1, the lighted cactus garden will be available for viewing between 5 and 10 p.m. and the retail stores will be open as well. Visits with Santa are also available through December 24 from 5 p.m. to 9 p.m.
A thousand lashes on the narrator of the video clip. You ought to start pronouncing the word Nevada like Nevadans do… Nevada — Due to the format restrictions of this page, I can’t use the correct grammatical mark on the first “a” to help you, but if you look at this page — you’ll see what I mean. Look at the spelling of the word in the top left-hand corner of this page.